This article is about the present transit agency. For the transit agency from 1951 to 1964, see Los Angeles Metropolitan Transit Authority. "Los Angeles Metro" redirects here. For other uses, see Los Angeles Metro (disambiguation). The Los Angeles County Metropolitan Transportation Authority (branded as Metro; formerly branded as MTA or LACMTA) is an agency that operates public transportation in the Los Angeles metropolitan area. It was formed in 1993 out of a merger of the Southern California Rapid Transit District and the Los Angeles County Transportation Commission. It is chartered under state law as a regional transportation planning agency. Metro directly operates bus, light rail, heavy rail and bus rapid transit services. It provides funding and directs planning for rail and freeway projects within Los Angeles County. It also funds 27 local transit agencies as well as access paratransit services. The authority also partially funds sixteen municipal bus operators and an array of transportation projects including bikeways and pedestrian facilities, local roads and highway improvements, goods movement, Metrolink regional commuter rail, Freeway Service Patrol and freeway call boxes within the greater metropolitan Los Angeles region. Security and law enforcement services on Metro property (including buses and trains) are currently provided by the Los Angeles County Sheriff's Department's Transit Services Bureau via contract, in conjunction with Metro Transit Enforcement Department, Los Angeles Police Department and Long Beach Police Department. The Blue Line (opened 1990) is a light rail line running between Downtown Los Angeles and Downtown Long Beach. The Red Line (opened 1993) is a subway line running between Downtown Los Angeles and North Hollywood. The Green Line (opened 1995) is a light rail line running between Redondo Beach and Norwalk, largely in the median of the 105 Freeway. It provides indirect access to Los Angeles International Airport via a shuttle bus. The Purple Line (opened 1996 as the Red Line) is a subway line running between Downtown Los Angeles and the Mid-Wilshire district of Los Angeles. Most of its route is shared with the Red Line. Metro Busway is an express bus system with characteristics of bus rapid transit with two lines operating on dedicated or shared-use busways. The system runs a total of 60 miles (97 km), with 28 stations and over 42,000 daily weekday boardings as of May 2016. The Metro Busway system is meant to mimic the Metro Rail system, both in the vehicle's design and in the operation of the line. Vehicles stop at dedicated stations (except the Metro Silver Line portion in Downtown Los Angeles), vehicles receive priority at intersections and are painted in a silver livery similar to Metro Rail vehicles. The Metro Orange Line (opened in 2005) is a bus rapid transit line running between North Hollywood and Chatsworth. 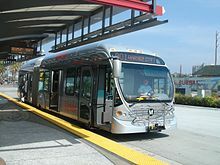 The Metro Silver Line (began operation in 2009) is a limited-stop bus line running between El Monte, Downtown Los Angeles, and Harbor Gateway, with some buses also serving San Pedro. Metro is the primary bus operator in the Los Angeles Basin, the San Fernando Valley, and the western San Gabriel Valley. Other transit providers operate more frequent service in the rest of the county. Regions in Los Angeles County that Metro Bus does not serve at all include rural regions, the Pomona Valley, the Santa Clarita Valley, and the Antelope Valley. Metro operates two types of bus services which are distinguished by the color of the buses. However, when mechanical problems or availability equipment occurs, a bus of any color may be substituted to continue service on the route. Metro Local buses are painted in an off-orange color which the agency has dubbed “California Poppy”. This type of service makes frequent stops along major thoroughfares. There are 18,500 stops on 189 bus lines. Some Metro Local routes make limited stops along part of their trip but do not participate in the Rapid program. Some Metro Local bus lines are operated by contractors MV Transportation, Southland Transit, and Transdev (formerly Veolia). Metro Express buses used to be painted in a dark blue color which the agency had formerly dubbed “Business Blue”, with routes designed as premium, minimal stop services along Los Angeles's extensive freeway network. There are 8 lines running as of 2018: 442, 460, 487, 489, 501, 534, 550, and 577. Some Metro Local lines also use the county's freeway system along their trip. They are labeled as Express services but make more stops on their trips and are not considered to be "premium" Metro Express lines. All Metro buses are CNG-powered, the largest such fleet in the United States. The CNG fleet reduces emissions of particulates by 90%, carbon monoxide by 80%, and greenhouse gases by 20% compared to diesel powered buses. Alternative fuel buses have logged more than 450 million operating miles since 1993, an industry record. Metro operates two transitways that carry multiple bus routes for part of their trips through Southern California. When traveling within the transitways, the buses run in express service, stopping only at stations. The transitways are meant to mimic the Metro Rail lines, because while each bus may have a different final destination passengers can board any bus and travel to any of the other stations. The two transitways are connected by a dedicated Metro Busway route, the Metro Silver Line. El Monte Busway (opened in 1974) is a combination transitway and high-occupancy toll (HOT) roadway that runs in the median of the San Bernardino Freeway ( I-10) and on a separate right-of-way. The transitway provides express bus service between Downtown Los Angeles and the San Gabriel Valley. Services are operated by both Metro and Foothill Transit. Harbor Transitway (opened in 1998) is a combination transitway and HOT roadway that runs in the median of the Harbor Freeway ( I-110). The transitway provides express bus service between San Pedro and Downtown Los Angeles. It carries buses operated by Metro, Orange County Transportation Authority, LADOT, Gardena Municipal Bus Lines and Torrance Transit. Metro Freeway Service Patrol: A joint effort between Metro, Caltrans, and CHP offering free quick-fix repairs and towing from freeways. HOV (Carpool) Lanes: 219 miles (352 km), 423 miles (681 km) both directions/each lane, of carpool, vanpool, and express bus lanes. Bike paths: 475 miles (764 km) of bikeways for commuter and recreational purposes. Metrolink: Partially funded by Metro, it is Southern California's regional commuter rail system servicing Los Angeles County, Orange County, Riverside County, San Bernardino County, and Ventura County, as well as Oceanside in San Diego County. All Metro passes are sold on TAP Cards, smart fare cards on which customers can load value or a pass; they are valid on all Metro buses and trains as well as most city buses. Faregates at some Metro Rail stations and the Orange Line require a TAP card, but Metro as a whole operates on a proof-of-payment system. The Los Angeles County Sheriff's Department, Los Angeles Police Department, Long Beach Police Department and Metro's fare inspectors conduct random ticket inspections throughout the system. If customers are caught without a valid TAP card, they may be fined and/or subject to community service. In 2007, with the consent decree with the Bus Riders Union (BRU) expired, Metro announced plans for a fare hike. The agency said that it needed to reduce its $100 million deficit, which would be done either by raising fares or reducing service. This proposal garnered strong opposition from Mayor Antonio Villaraigosa, Councilman Bernard Parks, the BRU, and low-income residents. In addition, Service Councils, composed of political appointees from various regions of Los Angeles County, approve service changes and oversee bus routes within a region. There are five regions: Gateway Cities, San Fernando Valley, San Gabriel Valley, South Bay, and Westside/Central. Service councils advise on planning and implementation of service within their area; call and conduct public hearings and evaluate Metro bus programs to their area; make policy recommendations to the Metro Board; and participate in quarterly meetings with the Metro Chief Executive Officer (CEO), Deputy CEO and management staff. A complex mix of federal, state, county and city tax dollars as well as bonds and fare box revenue funds Metro. The Metro budget for 2015 is $5.508 billion. Below is an example of funding sources for a Metro budget many years ago, and the example below does not include an additional sales tax revenue from Measure R that passed a few years ago. Funding sources as per earlier budget. Expo Line train arriving at La Cienega/Jefferson station. As part of Metro's ATMS project, most buses include a marquee displaying the date and time, Automatic Voice Annunciation (AVA) for audio and visual announcements for each stop, and an audio and visual Stop Requested announcement. MV Transportation, Southland Transit, and Transdev are bus contractors; these contractors currently operate a few NABI 40-LFW (7600-7949) series, all NABI 31-LFW (3100-3149) series, and some NFI XN40 (5600-6149) & (3850-4199) series. Metro Local buses are painted orange ("California Poppy"), Metro Rapid buses are painted red, and Metro Silver Line buses are painted silver. Metro Local buses acquired prior to the adoption of these colors in 2004 are white with a gold stripe around the bus; these buses been painted orange during their mid-life rehabilitation (except for the 5300-series New Flyer buses assigned to Metro Rapid lines, which were repainted in red livery in 2004-05). The 7000- and 7600-series buses acquired for Metro Rapid service in 2000 and 2002 are red with a white stripe along the top (7102-7112, 7617-7618, 7628, 7643, 7646 were white with a red Metro Rapid logo on all sides and some of these buses have been repainted to standard red and white and a few have been converted to Metro Local service), but some have been repainted to the current red and silver livery. Most had been repainted beginning in 2007; some have been repainted either in the updated Metro Rapid scheme or in Metro Local colors. Metro operates the nation's largest fleet of CNG-powered buses. The CNG fleet reduces emissions of particulates by 90%, carbon monoxide by 80%, and greenhouse gases by 20% over the 500 remaining diesel powered buses in the fleet. Alternative fuel buses have logged more than 450 million operating miles since 1993, an industry record. Metro has retired all diesel buses (not including contracted buses) and became an entirely clean-air fleet in January 2011. Beginning December 17, 2006, Metro Local Lines 233 (Van Nuys Blvd.) and 204 (Vermont Ave.) were the first Metro Local lines to use 60-foot (18 m) NABI articulated buses (9400-9494 and some 9500-9594 series). These buses are also currently in use on Metro Local Line 40 (Hawthorne Bl./Crenshaw Bl./MLK Bl./Broadway Ave.), Metro Local Line 66 (8th Street/E. Olympic Bl.) and Metro Local Line 207 (Western Ave.). Countywide Planning: Plans to optimize efficiency and usability in transportation for all of Los Angeles County. Environmental Compliance and Services: A framework for environmentally friendly implementation and operation of Metro services. In May 2009 Metro started to set up a Multi Mobility Working Group, which may lead to a change in TDM funding for bicycle projects as detailed in a separate entry on bicycle transportation planning in Los Angeles. LACMTA was formed in 1993 from the merger of two previous agencies: the Southern California Rapid Transit District (SCRTD or more often, RTD) and the Los Angeles County Transportation Commission (LACTC). RTD was during the 1960s to 1980s (until the LACTC was created) the "800 pound gorilla" in bus transportation in Southern California, operating most public transportation in Los Angeles, Orange, San Bernardino, and Riverside Counties, although outlying services began to be divested in the early 1980s. Metro has expanded its Metro Rapid bus system with a goal of 28 lines since 2008. A Special Master ruling in December 2005 requires Metro to increase service on all Rapid bus routes to every 10 minutes during the peak period and every 20 minutes during the mid-day and evening. Service would be required to operate between 5 a.m. and 9 a.m. on all Rapid routes. Metro has chosen not to appeal the ruling and began implementation on all Rapid routes in June 2006. In addition, the agency is embarking on a massive bus restructuring effort entitled Metro Connections. The project is designed to convert the current grid-based bus system, implemented in 1980, to a hub and spoke system focused on activity centers. The system is to be phased in the next four years, and will include new express routes and reconfigured local service. Suburban service and low ridership shuttles will be considered for operation by municipal agencies, restructuring, or cancellation. 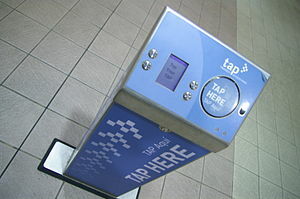 The Universal Fare system called 'TAP' which stands for Transit Access Pass was introduced to the public in early 2010. The TAP smart card uses near-field communication allowing bus and rail passengers to physically tap their cards on the farebox or fare-gate for faster boarding. The Crenshaw/LAX Line is being built from Aviation/LAX station on the Green Line to Expo/Crenshaw station on the Expo Line, passing through Inglewood and Crenshaw, Los Angeles. It will connect with a people mover to serve Los Angeles International Airport. A further possible phase will extend the line to Hollywood to connect with the Red Line. Metro is planning an extension of the Gold Line into the San Gabriel Valley to the San Bernardino County border city of Montclair. The first phase of this extension, to Azusa, opened on March 5, 2016. Construction for Phase 2 began on December 2, 2017 and is expected to complete by early 2026. The Regional Connector is a tunnel under Downtown Los Angeles, joining the Gold Line at Little Tokyo Station (1st Street and Central Avenue) to the Blue and Expo Lines at 7th Street/Metro Center. This will lead to the creation of two lines, one between Long Beach and Azusa, and the other between East Los Angeles and Santa Monica. Bus Rapid Transit along Vermont Avenue between the Red Line at Hollywood Blvd. and the Green Line at 120th St. Bus Rapid Transit from LAX to the Expo Line at Santa Monica along Lincoln Blvd. Metro has a project list including all current projects being pursued in Los Angeles County, as well as an interactive map. Interior of Metro Local Bus – NABI 40 LFW. Metro Local Line 166 using a NABI 45C bus. Line 166 at the Chatsworth Orange Line Station. Metro Local Line 166 departing. Interior of a Metro Gold Line train car – Breda P2550 train. Metro Silver Line bus departing Manchester Silver Line station. Inside a NABI 45 compobus on Los Angeles Metro Local line: 81. ^ a b c d e "Facts At A Glance". Metro. Retrieved 16 February 2016. ^ a b "Ridership Statistics". www.metro.net. Retrieved 2017-10-21. ^ a b Dickens, Matthew. "Public Transportation Ridership Report Fourth Quarter 2017" (PDF). APTA. American Public Transportation Association. Retrieved 8 July 2018. ^ "Phillip Washington, Denver transit chief, to become Metro's new CEO". KPCC. March 12, 2015. Retrieved 19 April 2015. ^ " Help & Contacts." Los Angeles County Metropolitan Transportation Authority. Retrieved on March 18, 2010. ^ Scauzillo, Steve (13 December 2018). "Because they're out of colors, LA Metro will rename all its train lines and rapid busways with letters in 2019". Los Angeles Daily News. Retrieved 14 December 2018. ^ Scauzillo, Steve (February 26, 2016). "When is the grand opening of the Gold Line Foothill Extension?". San Gabriel Valley Tribune. ^ Nelson, Laura J. (February 25, 2016). "Metro Expo Line to begin service to Santa Monica on May 20". Los Angeles Times. ^ "Bold New Look Proposed For Metro Buses, Trains, 'M' Logo". Los Angeles County Metro. 19 June 2003. Retrieved 2008-03-10. ^ "Final Report Los Angeles Metro Rapid Demonstration Program" (PDF). ^ "Metro Gets Grant For Purchase of More Clean-Air Buses". Los Angeles County Metro. 26 April 2006. Retrieved 2007-01-07. ^ "Introducing Metro Bike Share". Retrieved September 15, 2016. ^ "Metro Bike Share: About". 2015-01-27. Retrieved October 21, 2018. ^ Scauzillo, Steve (September 21, 2018). "Lessons from a failed bike-share program in Pasadena". Pasadena Star News. Retrieved October 21, 2018. ^ "Metro Rail Gating Study" (PDF). November 15, 2007. ^ Chen, Anna (2018-06-13). "Transfers between most TAP-participating agencies will be exclusively on TAP starting July 15". The Source. Retrieved 2019-03-06. ^ "LA metro 2015 funding sources" (PDF). ^ "Ridership Statistics". www.metro.net. Retrieved 2016-04-17. ^ "California Code, Public Utilities Code – PUC § 130051". Findlaw. Retrieved 2019-03-02. ^ "Los Angeles County Metropolitan Transportation Authority: It Is Too Early to Predict Service Sector Success, but Opportunities for Improved Analysis and Communication Exist." page 41, California State Auditor, December 2003. Retrieved May 1, 2006. ^ "Metro in Transition". Streetsblog Los Angeles. 2009-12-02. Retrieved September 13, 2016. ^ "Metro Adopts Fiscal Year 2011-12 Budget". www.metro.net. Retrieved 2016-04-17. ^ "Looking for a Way to Fight Climate Change?". June 2017. ^ "Looking for a way to fight climate change? Try taking transit, walking or biking". metro.net. 1 June 2017. Retrieved 7 March 2018. ^ Overview of Transportation Topics. Realtor.org. Retrieved April 4, 2006. ^ "Metro Connections Update" (PDF). January 2006. ^ Loos, Chris (April 2, 2015). "Metro Proposes Simplified Naming Convention for Rail Lines". Urbanize.LA. Retrieved 3 April 2015. ^ "The long-awaited Metro Purple Line Subway Extension is now under construction". ^ Sharp, Steven (September 15, 2015). "Metro Exploring New Options for West Santa Ana Branch". Urbanize.LA. Retrieved June 7, 2016. ^ Nelson, Laura J. (May 23, 2018). "Metro narrows the options for a light-rail line from downtown L.A. to Artesia". Los Angeles Times. Retrieved 26 May 2018. ^ Escobar, Allyson (2017-06-11). "Orange County's first modern streetcar plans to be the future of transit on track". Los Angeles Times. Retrieved 2017-08-06. ^ a b "Measure M: Metro's Plan to Transform Transportation in LA". The Plan. Retrieved 2016-11-11. ^ "Measure M project descriptions". The Source. 2016-11-09. Retrieved 2016-11-11. ^ "New Flyer C 40 LF in "Crash"". ^ a b c d Roe, Mike; Fonseca, Ryan (March 7, 2019). "Captain Marvel Takes LA Metro, But She's Not The First Movie Hero To Go For A Ride". LAist. ^ "Neoplan AN 440 Transliner in "The 40 Year Old Virgin"". ^ "NABI 416 in "Battle: Los Angeles"". 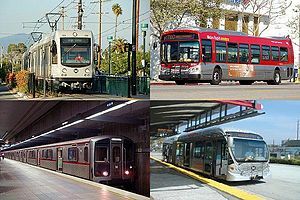 Wikimedia Commons has media related to Los Angeles County Metropolitan Transportation Authority.